PRTG Alternatives - Here's Our Tops Picks for Network Monitoring in 2019 ! PRTG Network Monitor is a powerful solution that monitors your entire infrastructure, including systems, devices, traffic and applications. This product from Paessler AG can monitor and classify systems based on different parameters such as bandwidth usage, up-time and more. PRTG presents an easy-to-understand hierarchical view of a network, generates an exhaustive set of reports and even gives plenty of alerts, so you can always stay on top of what is going on in your system. $60,000 for unlimited sensors in five core installations. The above pricing clearly shows that PRTG is expensive and hence, is not ideal for all organizations. Besides cost, there are also a few other things that can be a spot of bother. Adding and removing sensors or moving devices from one group to another can be quite a hassle. Also, it provides only limited support for Windows 10. If any of these downsides are likely to impact you, it makes sense to look for alternatives to PRTG. 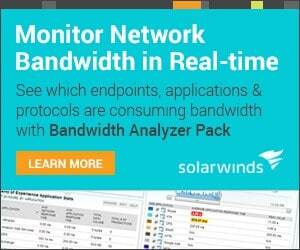 Solarwinds Network Performance Monitor is a popular alternate to PRTG. This is an advanced monitoring network that reduces outages and improves overall performance. Gives a hop-by-hop analysis of critical paths. Allows you to drag and drop metrics on a common timeline for visual correlation of all your data. Offers a customizable topology and intelligent alerts that take into account various dependencies. Automatically discovers and maps devices, metrics, link utilization and more. Provides insight into the health and performance of any F5 service delivery environment. Calculates exhaustion dates using customizable thresholds. This can help with capacity planning, forecasting and budgeting. Retrieves performance metrics for autonomous access points, clients and wireless controllers. Comes with out-of-the-box alerts and reports, that are advanced and highly relevant to the performance of your infrastructure. Installs and deploys within just an hour. 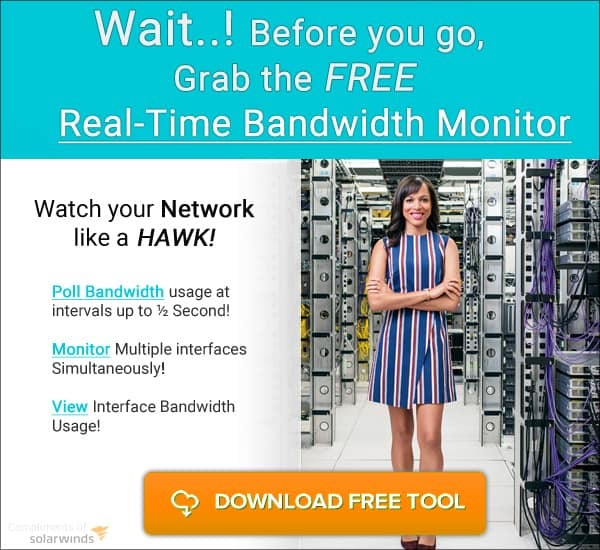 Offers a web-based network performance dashboards, views and charts. Uses Packet Capture and Analysis feature to determine the quality of end-user experience. Dynamically calculates baseline thresholds from historical network performance data. Monitors, alerts and reports key network monitoring metrics such as temperature and power supply. Operating system: Windows server 2008 R2 SP1, Windows server 2012 and Windows server 2012 R2. Database: All versions of SQL Server 2008, 2008 SP1, 2008 SP2, 2008 SP3, 2008 SP4, SQL Server 2008 R2, 2008 R2 SP1, 2008 R2 SP3, SQL Server 2012, 2012 SP1, 2012 SP2, 2012 SP3, SQL Server 2014, 2014 SP1 and SQL Server 2016. .NET framework: version 4.5 is required. 30 Day FREE Fully Functional Trial, Download Below to Get Started! OpManager from ManageEngine is a pwerful and user-friendly monitoring software that can monitor different elements in your infrastructure such as routers, switches, firewalls, servers, virtual machines and more. Visualizes and resolves WAN or router problems. Monitors routers, interfaces, bandwidth and WAN links for both availability and performance. Proactively monitors VoIP call quality across the entire WAN infrastructure. it even troubleshoots poor performance of any VoIP call. Automatically maps L1 and L2 networks to identify network outages and performance problems. 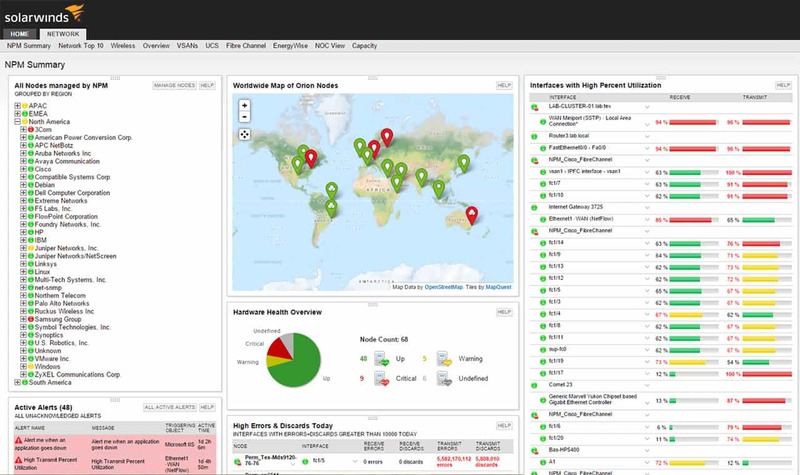 Leverages Cisco IP SLA technology to monitor WAN link availability and latency. Monitors physical and virtual servers across different operating systems such as Windows, Linux, Unix, VMware, BSD and more. Uses more than 70 VMware performance monitors to agentlessly monitor VMware virtualized servers. Uses WMI credentials to monitor the performance of hyper-v hosts and guests. Uses SNMP/CLI/WMI to manage processes running on discovered devices and to gather pertinent data. Supports more than 300 SNMP traps per second. Monitors critical security logs across all Windows servers and workstations. Provides insights into capacity performance and configuration of RAID controller devices. Automatically discovers fabric switches in a SAN environment. Creates an exact replica of your data center in 3D format. 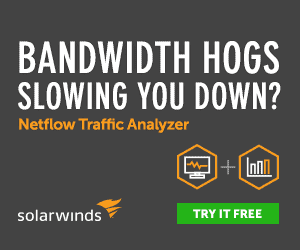 Tracks your network bandwidth usage in real-time. Allows you to extend the scope of OpManager by installing add-ons. FREE Trial Available and Essential edition starts at $715 for 25 devices while Enterprise starts at $19,795 for 500 devices. Nagios XI is a comprehensive enterprise server and network monitoring software. It is an integral component of Nagios’ powerful suite of applications. Here is a look at what Nagios XI can offer for your organization. Monitors all the critical components of IT infrastructure including applications, services, operating systems, network protocols, devices and more. Offers a web interface that gives access to a powerful dashboard. 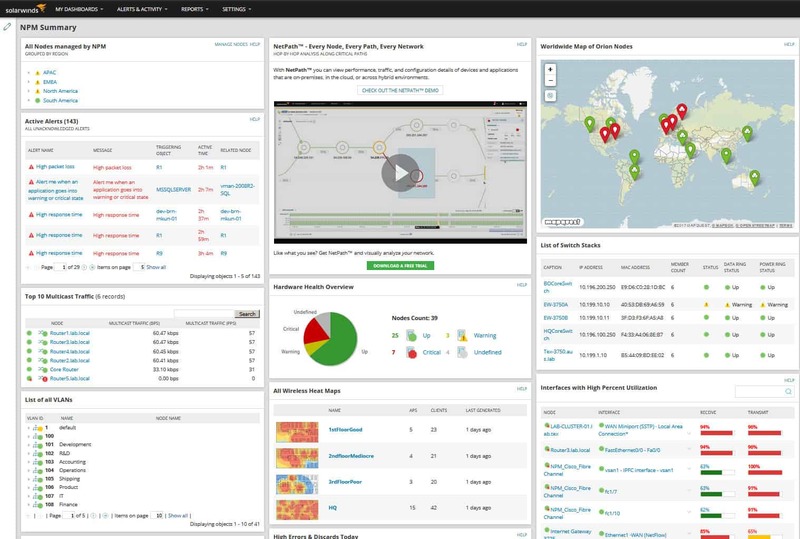 You can monitor and control every aspect of your infrastructure monitoring through this dashboard. Uses a powerful monitoring engine called Nagios Core 4. Comes with configuration wizards that make it easy for users to do many operations such as adding new devices. This reduces a lot of time and effort for users. Capacity planning makes it easy to identify existing issues and come with the right infrastructure mix for optimal performance. Its advanced graphs give a quick insight into the performance and availability of different devices in the network. Delivers multi-tenant capabilities. It means this software can accommodate multiple users and provides the capability to manage these different users. Gives the option to extend its capability through APIs and add-ons. There are two editions in Nagios XI, namely, Standard and Enterprise. Enterprise edition has all that is available in the standard edition, and to top it, this edition has the following features. Standard edition starts from $1,995 while enterprise edition starts from $3,495. WhatsUp Gold is a network monitoring software from Ipswitch that can cover the end-to-end of your infrastructure, right from the network edge to cloud. Provides complete visibility into the status of network devices, systems and applications. Leverages topology-aware monitoring to understand network dependencies, so you receive only the most relevant alerts. Sends notifications through SMS, web, email or Slack, depending on your preferences. Automatically discovers and maps all the devices on your entire network. Gives you the option to create dashboards that provide the most relevant information needed to troubleshoot problems. Makes it easy to add credentials such as SNMP, ADO, Windows domain administrator, VMware, JMX and SMIS. Comes with active monitors that poll devices for an up or down response. Provides advanced reports that gives you information in a well-arranged format. Also offers flexible scheduling and email distribution. Allows any report to be exported into multiple formats. There are three editions of this product, namely, Premium annual subscription, Premium license and Total Plus license. Zabbix is an enterprise class monitoring solution that can pretty much monitor anything, regardless of the infrastructure, services, applications or devices. Detects problem states within the incoming information, so there is no need for a separate analysis. Predicts trends, detects anomaly and gives root cause analysis. Native web interface gives a visual overview of the entire network. You have the choice to allow Zabbix to fix all issues automatically. Customizes messages based on recipient’s role. Periodically scans devices and discovers them automatically. To conclude, PRTG is a great tool for Monitoring networks and your Infrastructure, as well as keeping your critical systems monitored and online. If your looking to move to a different platform for your IT Monitoring Solution, then we suggest one of the aforementioned software packages – they are all Great Replacements to PRTG and will more or less, complete the same tasks! We hope these alternatives will help you make the right decision for your organization.